The startup, backed by Khosla Ventures and KPCB, says it can deliver power at 10.4 cents per kilowatt hour today. Ausra, a Palo Alto, Calif.-based solar-thermal startup, came out of stealth mode Monday with an announcement that it raised "more than" $40 million from venture-capital firms Khosla Ventures and Kleiner Perkins Caufield and Byers. It's no surprise that Vinod Khosla, founder of Khosla Ventures, would back solar-thermal power, as he has been a prime advocate of the technology (see Cooling with the Sun). Ausra's technology can help utilities "meet the dual challenges of economic growth and carbon constraints," he said in a press release. "Ausra's technology replaces smoke with mirrors by eliminating fuel use for power generation, and sets a new benchmark for the cost and scale of solar power." While solar-thermal power has long been hailed as a potentially far cheaper form of solar power for utilities, it previously had been limited to small demonstration plants and gone nowhere. Some blame a lack of government backing after the oil crises in the late '70s and early '80s ended; others blame a nonexistent market and a paucity of funding for larger plants. Unlike rooftop solar-electric projects, which compete with retail prices for electricity, solar-thermal projects compete with wholesale utility prices, and must be large to be economical. And because such large amounts of money are at stake, solar-thermal technology has had a slower start than solar-electric power. Still, Ausra is the latest example that the technology is gaining traction. 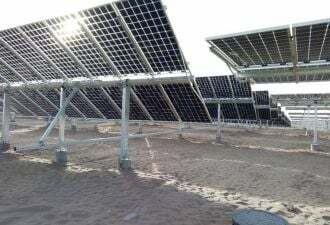 In July, Israel-based Solel Solar Systems announced it is building a large solar park in California after the Pacific Gas and Electric utility agreed to buy all 553 megawatts of the park's capacity, and Spain's Acciona Energy closed $266 million in project financing for its 64-megawatt Nevada Solar One project. "We see solar-thermal as one of the most, if not the most, promising of the renewable technologies," said Keely Wachs, spokesperson for PG&E. "It's cost-effective compared with many other renewables, and especially compared with solar [photovoltaics]." Ausra was founded in Australia as Solar Heat and Power, with technology based on research by David Mills, chief research and development officer for the company. Mills, who is best-known for developing so-called evacuated tube technology that is used in most of the world's solar-water-heating systems today, turned his work to solar troughs. In 2000, Peter Le Lièvre, now the CEO, got involved. At the time, he was a venture capitalist for Fairgill Investments, a VC firm in Australia, and he wanted to get a piece of Solar Heat and Power's technology. But the company declined him at first because it already had government support. Two years later, Solar Heat and Power changed its mind, accepting about $500,000 in VC backing. Then Khosla Ventures and KPCB showed an interest and brought the company to the United States last year. The company changed its name to Ausra, based on the name of an Indo-European goddess of the dawn, and hired its chief of finance, chief development officer and chief communications officer from AES, a large power company in Arlington, Va.
Ausra says its technology can cut solar-thermal costs to 10.4 cents per kilowatt-hour from an estimated 16 to 18 cents per kilowatt-hour today. True, that compares with about 9.7 cents per kilowatt-hour for coal-fired power plants and 8.6 cents per kilowatt-hour for natural-gas power plants today. But Ausra Vice President John O'Donnell said the company has the potential to cut costs to 7.9 cents per kilowatt-hour in three years and eventually - once it's building 700-megawatt power plants - to drop as low as 6.7 cents per kilowatt-hour. And, in the meantime, competitors' costs are expected to grow as emissions costs come into play and natural resources become less available. "Once solar-power projects are built at the scale, and with the same financing, as fossil-fuel power plants, we're cheaper," O'Donnell said. "We don't really need a level playing field." Ausra claims its lower cost comes from its design, as it replaces expensive, hand-built solar troughs with modules that can be made on a production line and dropped into place with a forklift. Instead of using parabolic troughs, which are expensive curved mirrors, pricey evacuated tubes, which are made by only two suppliers in the world, and complicated frames, Ausra's design uses fixed receivers that don't move and cheaper steel-backed troughs that can be kept low to the ground and stored upside-down at night so they are more protected from wind, storms and dew, Le Lièvre said. The company already has installed its first megawatt in Australia and is growing that project to 5 megawatts by January and up to 12 megawatts later. Ausra also is working on installing a 6.5-megawatt project in Portugal that it expects to finish in 2009 and is also expecting to announce a 177-megawatt project in California, he said. Of course, new technologies have not had much success in large solar-thermal projects so far. Mark McClanahan, vice president of solar project development for MMA Renewable Ventures, which finances, owns and manages solar projects, said the smaller track record and high price tag for such large projects makes the level of due diligence "extraordinarily high." And that means financiers are more sensitive to risk when it comes to concentrating solar-thermal projects. O'Donnell agrees that project financing is a huge issue. 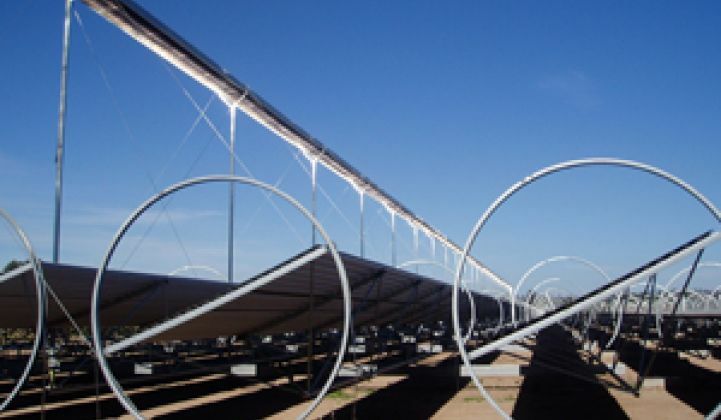 But he said Spanish and American banks are starting to show interest in solar-thermal projects. "The No. 1 issue most people have is price," he said. "And if you have a price that's cost-competitive, that issue [goes away]."